This book contains about every little detail imaginable about J. Frank Norris, many of his years in ministry, when he killed a man, and also his trial. I knew nothing about the man before I read the book but now I feel like I lived through the 1920s. David Stokes has an amazing gift with researching and arranging historical facts so that it flows like a fiction novel. It is rather on the long side; at times I wished for less facts because it was so long and sometimes a tedious read. But overall I really enjoyed Apparent Danger. J. Frank Norris was a very very interesting man and very controversial. I am glad I learned about him and his life through this book. It was unbiased and showed all sides of every ordeal. I enjoy history and learning about even the little people who had created a stir in the past. It lets me take a step back from present day and find out how people lived in another time. Times were different in some ways and not so different in others. I am glad I didn’t live during the time of J. Frank Norris. He wouldn’t have been a man I would have particularly liked or wanted around me. 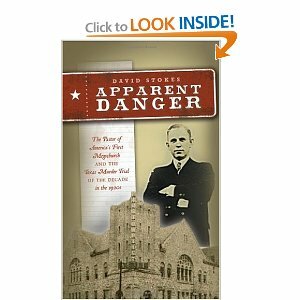 Buy It: You can buy Apparent Danger by David Stokes for $24.95. Disclaimer: This book was provided for review free of charge. I was in no way compensated for this post. Everything written is my own thoughts and feelings. Thank you!